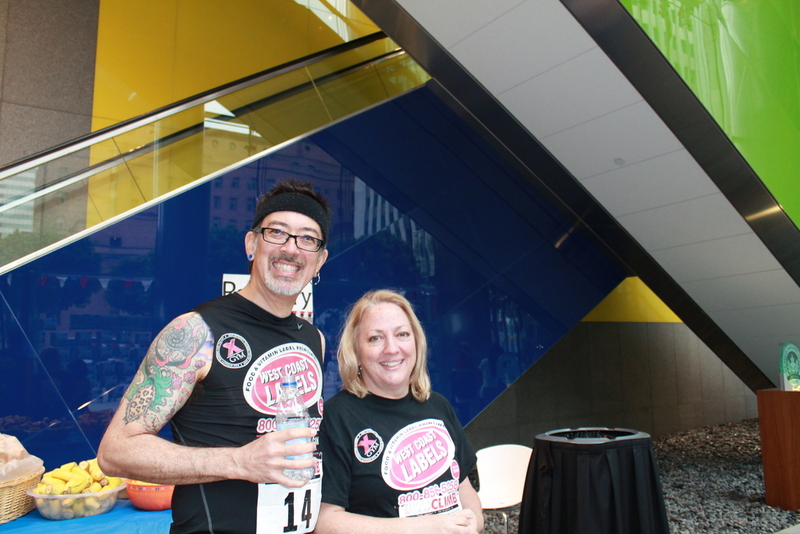 Today was the 5th Annual Fight for Air stair climb at Aon Center in downtown Los Angeles. This is the fourth time I’ve done this. Oddly enough, it never gets any easier. Kathleen and Lucinda were also doing the climb, so the three of us went downtown, along with a couple of Lucinda’s friends. It was kind of cold and windy, but for the most part that didn’t matter, since most of the event takes place indoors. This year, I’d made a detailed map of the stairs, and I’d worked out the most efficient way to climb them. And on Thursday, I’d thought of one more improvement to my method. The middle section of the building, from 24 to 44 is a bit odd. It’s still 22 steps per floor, like the rest of the building, but instead of two flights of 11 steps, it has one flight of 10, a landing and left turn, three steps up to a second landing and left turn. And then 9 steps up to the next floor. As a result of the three steps in the middle, the landings on the floors are wider than normal, and it’s hard to avoid having to take a step on the landing to get across it. But on Thursday, I realized that if I started with a single step with my left foot at the beginning, then I could double-step the stairs, and when I got to the next floor, I’d take a single step onto the landing with my right foot. I drew out a full-sized diagram of the landing on the floor, and I saw that if I made the step onto the landing wide enough, I should be able to stretch and get up the first step of the next flight with my left foot. So that would make a neat little 12-step pattern to climb each floor, and the load would be evenly distributed, with each leg doing 11 of the 22 steps. Being that I thought of this on Thursday, I didn’t get to try it in practice, but I figured I’d try it when I got to 24, and if it didn’t work out, I’d just fall back to my old method. I started in about the middle of the elite climbers group. I made sure to stay behind anyone who I knew would pass me. And when it was time, I ran into the stairs and started climbing. I got to the main staircase on 4 at about 40 seconds, which was right on schedule. By this time, the guy who’d started behind me had caught up. I kept going, but he didn’t try to pass, and by the time I got to 20 or so, he was falling off the pace. I checked my watch at 20, and I was on schedule. 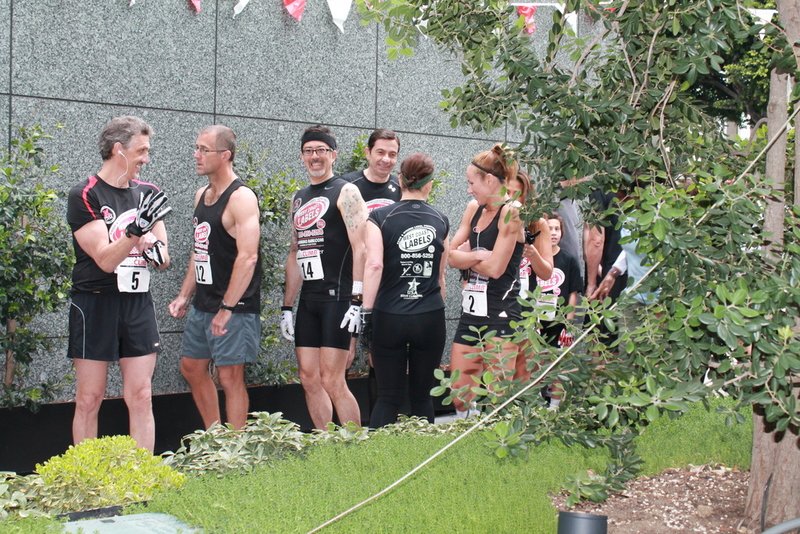 I’d made up split times, aiming to be at the top in 11 minutes. At 24, I tried out my new step pattern, and it worked. It was a little bit of a stretch, but after a few floors, it felt natural and smooth. And I could tell that I’d achieved my goal of avoiding a load imbalance between my legs. At 32, I looked at my watch, and I was a few seconds behind schedule. I think that not having that guy on my tail took away part of my incentive to go faster. One guy did pass me at about 38 or so. He was breathing hard and loud, and I just stepped aside and let him go by. It didn’t cost me any wasted steps, so that was all right. 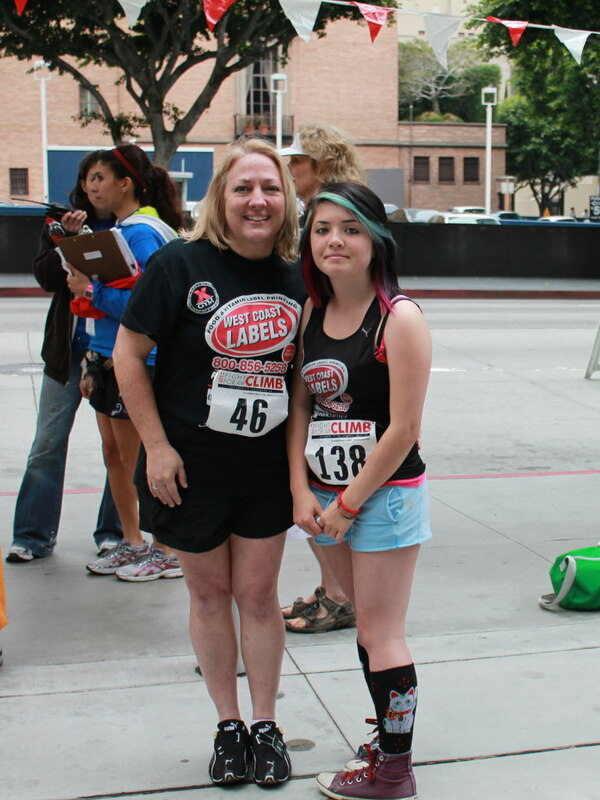 When I got to 46, I saw that I was about 20 seconds off my pace. Oh well. I kept on going, and got to 60 at about 25 seconds behind schedule. Then it was into new territory, on up through the last two floors and up to the roof. I came around the last turn through the roof door and somehow managed to put on a little sprint to the roof. I stumbled over the timing mat and then did the traditional face-plant on the roof. I stayed like that for a couple minutes to catch my breath. And then got up and had a look around. It was overcast, and the clouds were very low, so there wasn’t much of a view. I waited for few minutes until Lucinda came out. Then we both waited just a few more minutes for Kathleen. I also made a point of looking down at the final flight of stairs and counting the steps. This was the final piece of information I needed to finish my chart of the Aon staircase. And when Kathleen got to the top, I knew that she’d done very well this time, going something like 10 minutes faster than last year. After resting a bit, we walked down the second staircase to 60 and got the elevator back down to the ground. 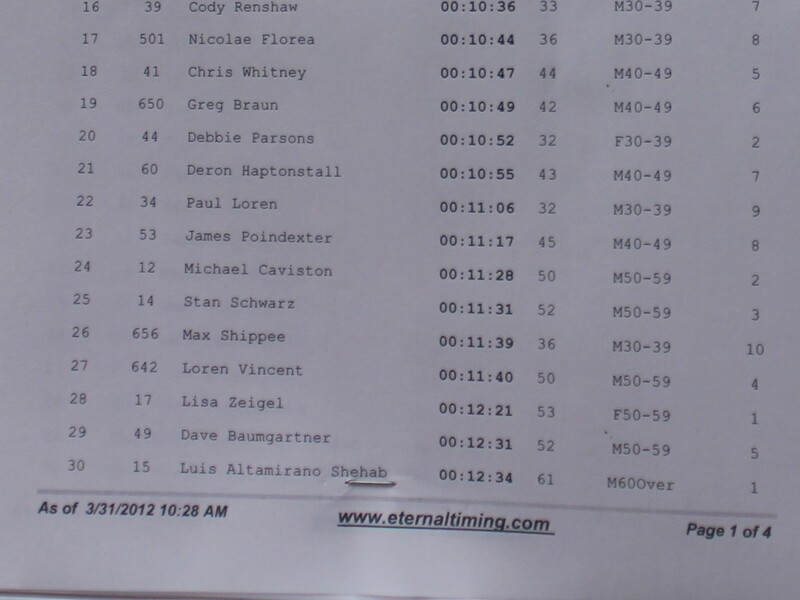 They were already posting results, and I was reasonably pleased with my time of 11:31. I really do think I could have gone faster, but it’s still faster than any of my previous times in this race, so I really can’t complain. I figured that since both Mark and Michael were there, I was racing for third place. And my time put me in third. 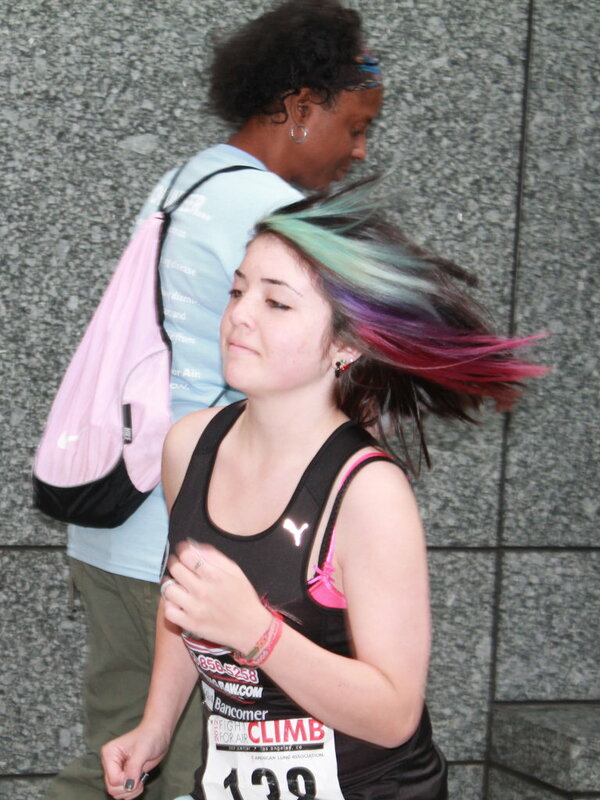 Then I looked a little closer and saw that I was only three seconds behind Michael. I guess he must have been having an off day. But if I’d known it was going to be that close, I would have gone a little faster. A bit later, I was talking with a reporter from the L.A. Times. He said that he was assigned to write an article about stair racing for publication some time in the late summer. 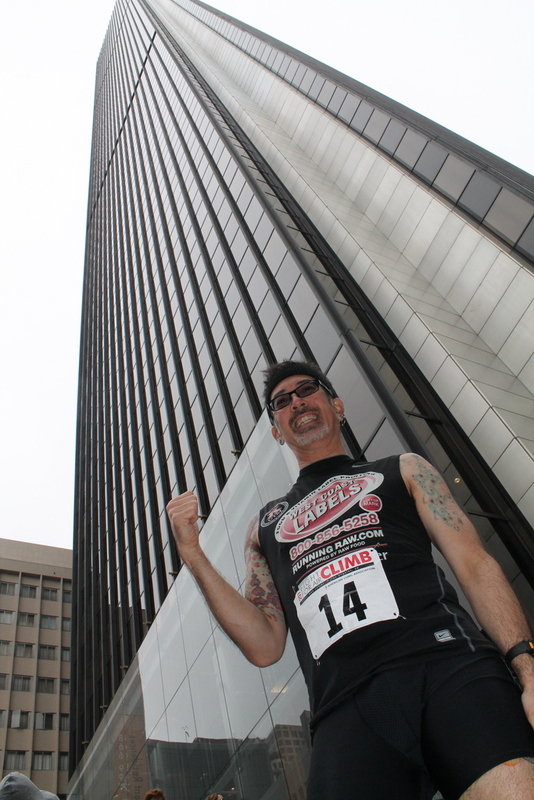 They want to publish it to help drum up interest in the U.S. Bank Tower stair climb in September. I told him about my charting the stairs and working out the most efficient line. He was going to climb the building in the last group, so he took some notes about proper methods for doing the turns on the landings, and he wrote down my time as the time to beat if he wanted an award. When I saw him later, he said that he didn’t beat my time, but that my pointers helped him a lot. So there’s value in being a stair nerd. Since I finally got the count of the final flight up to the roof, I can now definitively state that the published step count of 1,377 is wrong. The true count is 1,391. This makes the second race where I have made a detailed study of the stairs and found the published count was wrong. In the end, I got a certificate and medal for third place in the 50-59 age group. 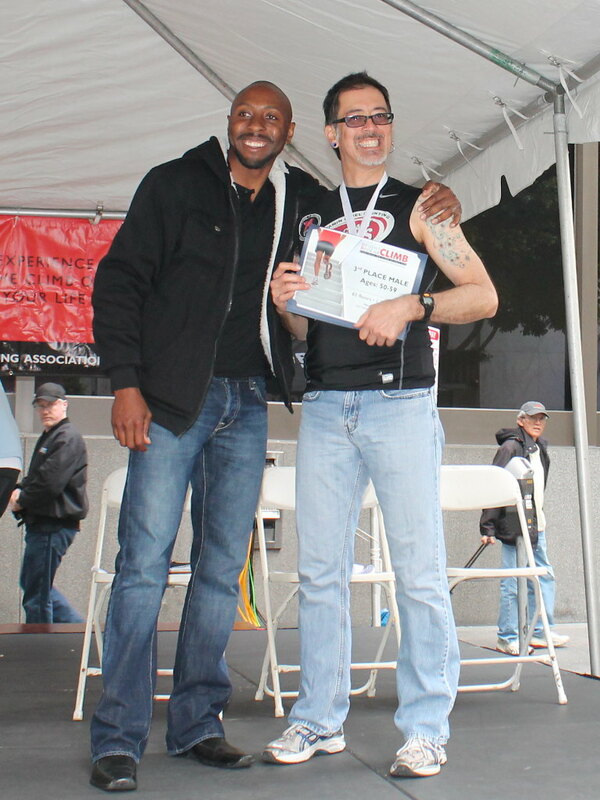 Even when it’s 50-something degrees and cloudy, being on the podium for an award just brightens up one’s day. Addendum: I’m not going to go into the controversy about the first place overall award. Let’s just say that it doesn’t pass the smell test. Shades of Rosie Ruiz.